Mumbai recently witnessed the launch & the unveiling of eminent poet & lyricist Basant Chaudhary’s book of poetry titled Chaahaton Ke Saaye Mein – In The Shadow Of Desires. Sonu Nigam along with award winning lyricist Sameer with much fanfare unveiled the book Chhahaton ke saaye Mein which is a collection of more than 100 Poems, Nazms & Ghazals with the underlying theme of love. Also present were stalwart Hindi poet Vishnu Khare & lyricists Hasan Kamal & Sameer, making the literary event abuzz with their presence. Later, the soulful rendering of the title poem, sung by Sonu Nigam enthralled the audiences. The song is composed by Rinkoo Sushant -Shankar. Vishwas Kini & Suelen feature in the video directed by Prathamesh Patil. Shamita Shetty Gifts Herself A Luxury Car! Shamita Shetty, who has an interesting line up of projects including an international movie, The Tenant & action – adventure reality show, Khatron Ke Khiladi, has recently gifted herself a luxurious car. It is Shamita’s way of pampering herself since she wanted to buy a high – end Sports version since a long time. She already had a car in her mind, BMW 630i GT and her super cool car was recently delivered to her place. The trailer of Satyameva Jayate starring John Abraham, Manoj Bajpayee, Aisha Sharma & Amruta Khanvilkar was released at an event in Mumbai. Along with the star cast of the film also present were producers Bhushan Kumar & Nikkhil Advani & Milap Milan Zaveri (Directors). The film revolves around a police officer who fights against corruption. The film is high on action & drama. Satyameva Jayate produced by T – Series & Emmay Entertainment is slated to release of 15th Aug, 2018. Unlike those actresses who end up being a 1 hit wonder, Prachi Tehlan carved a niche for herself in the industry. With an unexpected entry in entertainment industry, Prachi turned every hurdle into an opportunity and left behind almost every leading lady of the Indian television including Divyanka Tripathi & Deepika Singh. She is counted amongst those actresses who left a mark in the Indian television & Punjabi film industry, and now is all geared up to sizzle the Malayalam film screen alongside Mammootty. Project titled as Mamankam, the movie is one of the most expensive film ever made in the Malayalam industry. After bringing laurels for the nation in the game of Netball & Basketball, Tehlan stepped in the television industry through her role of Aarzoo in the Star Plus show Diya Aur Baati Hum. Later, Prachi was shortlisted for another prime time show Ikyawann in the first go but ended up getting finalized only after a period of 1 year. There have not been many actresses who could match Tehlan’s pace in stepping up the ladder of success just in the matter of 2 years of her journey in this industry. Indeed she proved her worth. The peppy dance number ‘Zingat’ from 2016 Marathi hit Sairat was an instant hit amongst the masses & the entire nation was swinging to its beats. Now, the song has been reprised in Dhadak starring Janhvi & Ishaan which is a Hindi adaption of Sairat. The reprised song is composed by Ajay – Atul who also composed the songs of the Marathi hit. For the Hindi version, Amitabh Bhattacharya has been roped in as the lyricist. 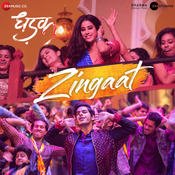 Dhadak’s “Zingaat” has been choreographed by Farah Khan. Dhadak directed by Shashank Khaitan, is produced by Zee Studios & Dharma Productions. The film is slated to release on 20th Jul, 2018. Kriti Sanon On How To Up Your Ms.Taken Style! Kriti Sanon who made a foray into the field of designing a year ago by launching her label Ms.Taken in collaboration with Anjana Reddy’s USPL was recently spotted at Mehboob Studios in Bandra, shooting for her brand the diva, recently crowned the “Style Icon Of The Year at IIFA 2018 Bangkok, is said to have upped the style quotient of her line Ms.Taken. Western wear brand Ms.Taken targets the bold & the carefree woman of today and is known for its fun & quirky designs. If the sneak peek into the new Autumn – Winter collection from Ms.Taken is anything to go by, then we know for sure that the line is going to be both cheeky & stylish. Aalim Hakim Blessed With A Baby Boy! Celebrity hairstylist Aalim Hakim who styles some of the biggest actors in B – Town like Ranbir Kapoor, Sanjay Dutt, Ajay Devgn & wife Shano Hanspal Hakim were blessed with a baby boy on 27th Jun, 2018. What’s interesting is that 2 years ago on the same day, the duo became parents for the 1st time ever and were blessed with a boy. Both the mother & the child are doing fine. The parents have named their newborn Star. Wishes have been pouring in from Aalim’s friends from the industry and the stylist couldn’t be happier on the arrival of his new born.